2014 is officially coming to an end and I have decided to keep up with my tradition to look back at personal highlights from another year of blogging. 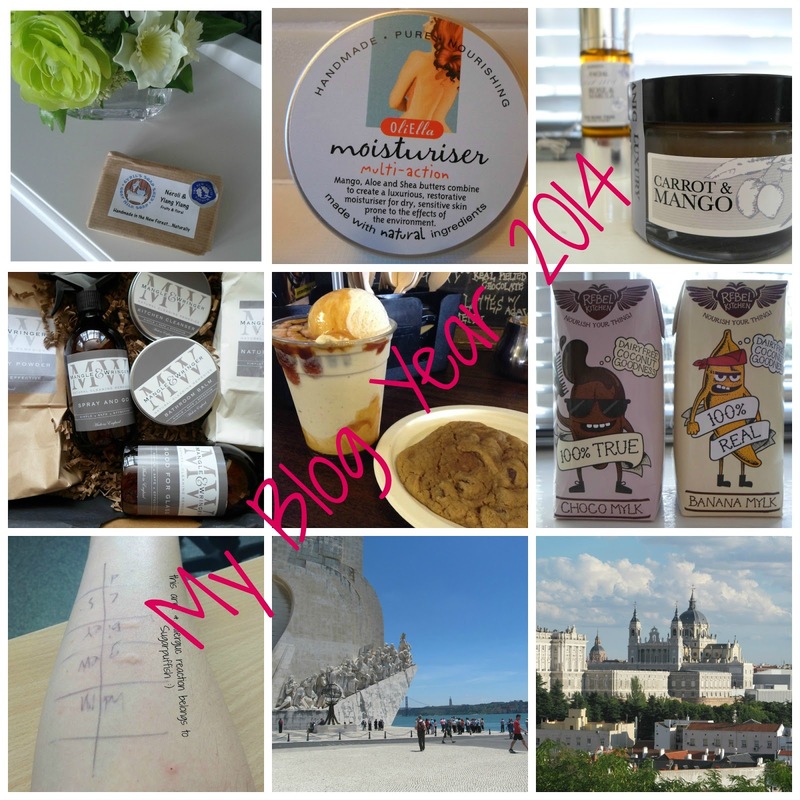 Looking back through my blog posts, I have reviewed some lovely products, many of which I am sure will be repurchased in 2015. I have written reviews of Chilly B, Circaroma, Cyril’s Soap Shed, Dash Skincare, OliElla, Olive & Rose, Orchard View, Pure Chimp, Ruth Romano, Saint Maren, The Aromatree Company, The Earth Work Cosmetics, The Rose Tree, Tiddley Pom and TouLou. I wanted to give a mention to Mangle & Wringer because their household cleaners are still keeping my kitchen sink clean. I have been super impressed with their products. My haircare routine has remained unchanged. I still love Odylique Gentle Herb shampoo and Desert Essence Red Raspberry conditioner. I predicted Blue Labelle would be a repeat purchase throughout 2014 and I was right. Other products which have impressed me have been from Chilly B, the OliElla Moisturiser and Bloom Remedies Pillow Mist. This year I was asked back to help judge for the Free From Skincare Awards and I also had the opportunity to do the same for the Free From Food Awards. The latter put me off eating cereal for the rest of 2014 (#joke). This year I attended my first meet up and not just one but two of them. There was the Field Trip Tour in July and the Reading Meet Up in October. I had a wonderful time and finally met all the beautiful ladies who I chat with on Twitter. Let me give a shout out to Rachel, Jen, Amber and Liz for being awesome. I feel as if 2014 has been a bumper year for Free From foods. I discovered Rebel Kitchen, Ten Acre Crisps, Almond Dream, Jollyum, Violife, Frank Bars, Nom Bars and Sweet Freedom Choc Shot. I also had a memorable visit to Cookies & Scream, in Camden. This year, I set the wheels in motion to have my allergies reassessed. As much as I appreciate the NHS the wait between appointments has been lengthy. So far I’ve had some of my existing allergies confirmed but was also diagnosed with OAS and birch pollen allergy. I had referrals to a dietitian, a dermatologist and I will return to my Allergy Consultant in 2015. This year I visited Lisbon which I instantly fell in love with, who can forget that little Vegetarian cafe I stumbled across in the maze of cobbled streets. I also visited Madrid and filled up on paella and culture. 2014 has certainly been enjoyable and interesting. I haven't made any specific plans for my blog in 2015 but I hope you will continue to join me on my blogging journey. It's been great to see you... four times this year?! That's more often than I see a lot of my family!! haha!